From the inside page: “In any account of the best in contemporary science fiction, both in America and abroad, the name of Frederik Pohl must figure prominently. As solo author, collaborator, and creative editor, he has achieved a body of work which has aroused admiration wherever it has been read. Since he is still a young man (36), the future looks bright for this chronicler of the future. Here is the book for which many readers have been waiting, a collection of his best short stories. In it you will find such gems as “Let the Ants try,” a chilling horror story: “The Tunnel Under the World,” a robot story with startling difference: and “Target One,” an ironic and moving narrative of time travel. And a number of others. From the inside flap: “In which we find Jherek Carnelian, one of the small population of hedonistic immortals remaining on earth at the end of time, still obsessively in love with Mrs. Amelia Underwood, a reluctant time traveler from Victorian England. After narrowing escaping death in nineteenth-century London, Jherel again is separated from his love by several millenniums. And so he begins a new, headlong campaign–seesawing through space and time regardless of risk and consequence–to reunite himself with Mrs. UNderwood. From the inside flap: “On a planet quarantined since the earliest days of starfaring stands the ruin of a titantic citadel. Built by unknown hands in a forgotten past, the citadel is a labyrinth of death traps for those who seek its fantastic wealth. To this forbidden world comes Kian Jorry, a twenty-seventh-century freebooter, and his crew of eight. Each one is a specialist, willing to pit personal courage and skill against possible death. The risk is great, but the prize is fabulous. The youngest member of Jorry’s crew is Axxal, a Quespodon. His shipmates respect Axxal’s strength, but consider him and his people little more than beasts of burden for the more advanced races of the galaxy. Quespodons have been oppressed and exploited since first encounter. Axxal is to be no exception. 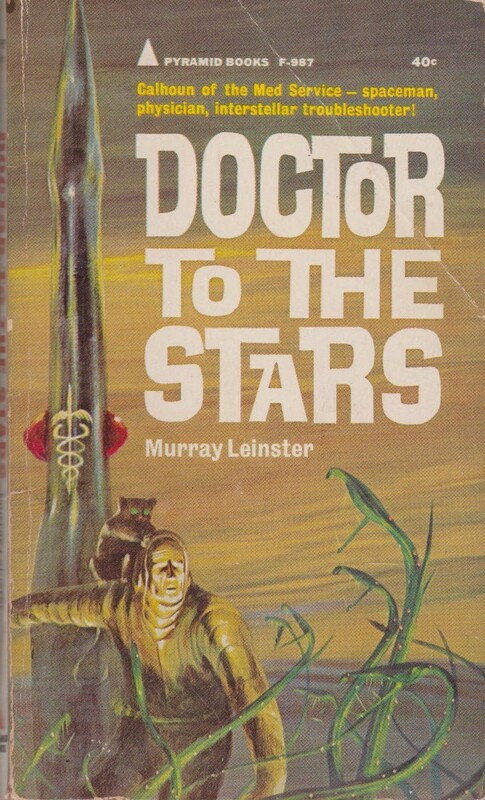 From the back cover: “In these three exploits of the Interstellar Medical Service, Murray Leinster carries on the adventures of his most popular characters–Calhoun of the IMS and Murgatroyd, the walking laboratory. I have to admit,I’ve never been keen on Pohl’s stuff.I couldn’t finish his collection,”The Man Who Ate the World”,it was so dull.I preferred Robert Heinlein’s writings.The best piece he wrote,was in “Dangerous Visions”,although I was far from overawed by it. I hope you like the second volume in Michael Moorcock’s novel trilogy,although I know you weren’t too keen on the first book.I really did enjoy the series,despite any flaws it contained.I thought it was one of the best things he ever wrote at the time. Far more a fan of Pohl than Heinlein (based on various Pohl novels I’ve read, and various short stories I’ve encountered in collections here and there). I’m not inclined to read the Moorcock anytime soon. I’ve been reading too many other fascinating things of late to return to a series I did not enjoy! You’re making me want to track down these Morressy novels. It sounds potentially great, or at least a lot of fun. 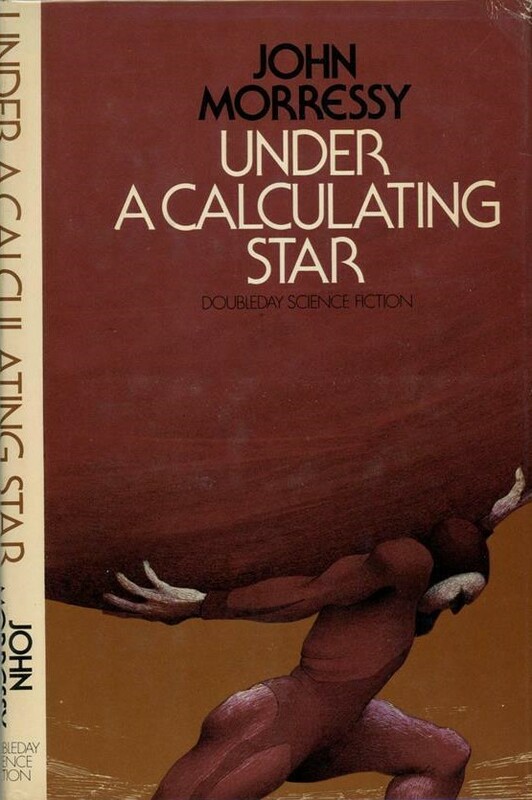 So, I did not enjoy Under a Calculating Star (1975) nearly as much as Frostworld and Dreamfire (which is my recommendation as of this minute). That shows how our tastes differ then,even though I was never so keen on Heinlein.I didn’t mind his “Starship Troopers” though. Yes,I understand you’re reluctant to go straight to the second volume of the novel.I don’t feel any urgency to read any of then again at present either. Yes,I see your Abe review.The recent book I’ve read,is J.G. Ballard’s “Kingdom Come”,which isn’t nearly as good as his earlier novels.He was still writing very good fiction into the 90s though. I didn’t mind Starship Troopers either — but, the 20+ additional novels I read (for some mysterious reason) as a kid soured my views (The Cat Who Walks Through Walls, etc.)….. I have to agree with Richard about Frederik Pohl. The only one of his I really enjoyed was Man Plus. The most recent was the collection Turn Left on Thursday whose title was far more memorable than any of the stories. Prior to that were the collaborations with Kornbluth, classics The Space Merchants and Gladiator at Law. Didn’t care for either probably because of my dislike for sales weasels and lawyers. As for Heinlein, I couldn’t finish either of my last attempts at Starship Troopers or Farnham’s Freehold. 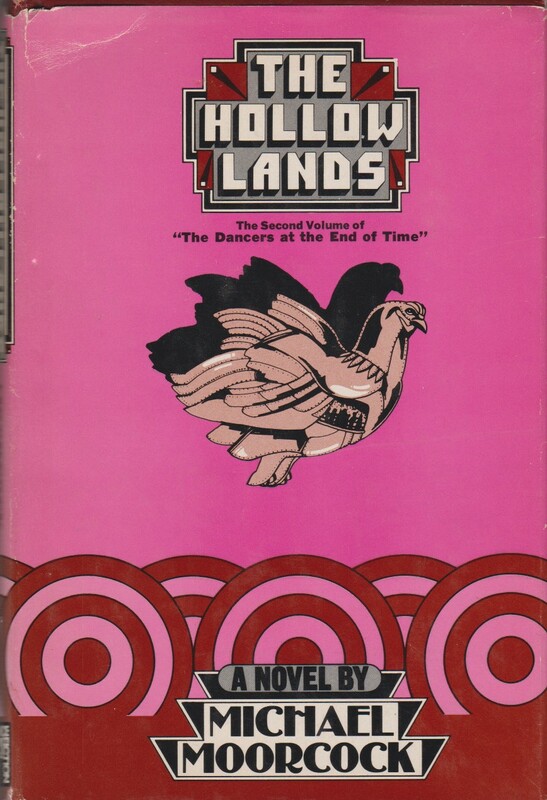 I read The Hollow Lands in the SF Book club edition. I have no desire to reread this since I couldn’t finish An Alien Heat. I have a Laser edition of Morressy’s The Extraterritorial that’s been sitting on the bottom of my TBR pile for probably 20+ years and it will stay right where it is for now. And to break all the negativity I admit I’ve always enjoyed Leinster’s efforts. The first were War With the Gizmos and Four From Planet 5 in the mid 60s. My favorite is the fix up, The Forgotten Planet, that I bought for that Schulz cover. I found the determination to overcome inspiring. I also enjoyed The Space Merchants (but I read that more than a decade ago). I’ve reviewed two additional Pohl novels (and disliked both) Drunkard’s Walk (1960) and Slave Ship (1956)…. That said, I am a huge fan of Gateway due to the Freudian focus and general unease and fear that permeates the novel. It’s near the top of my reread list — I read it when I wasn’t very aware of the New Wave movement and am curious about Pohl’s take on it! I might read one of the two Leinster Med Service collections I have soon. I did a quick Google for Bailey’s review without success. I don’t have twitter so it may be unavailable to me? 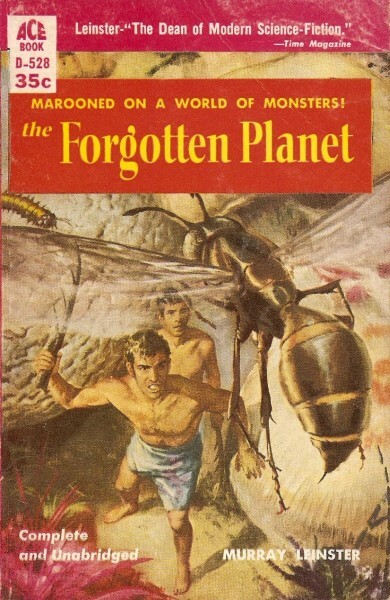 I almost asked what’s on your list of worst SF novels, but don’t want to be too negative today! That was most excellent! I imagine there must have been some backlash to this, similar to when Panshin published Heinlein in Dimension. The reality is that I don’t end up finishing most of my least favorite SF novels — I read Farnham’s Freehold in a period of my youth when I was less discerning about the quality of what I read…. So I finished it. I confess that I read nearly 540 books in a three year period from 1974-1976, most of which I will likely never read again. Back then I figured if I bought a book, then I was going to read it no matter how bad it was. I wasn’t very discerning back then. PS: I’ve kept a reading log since 1973 and average 101 books per year. Farnham’s Freehold is the worst. I kind of like Heinlein, and that novel almost makes me want to rethink that. Which Heinlein novels/stories did you enjoy? I only read five of his books,but I didn’t read and finish the first by him until I was nineteen. Cover wise I will pick the Leinster. I have read a number of the Med series stories and enjoyed them. I got Hubbard’s Ole Doc Methuselah so I can compare and contrast but have only read one story so far. I have read a far bit of Leinster over the years and one conclusion I have come to is that his short stories are often better that his novels. 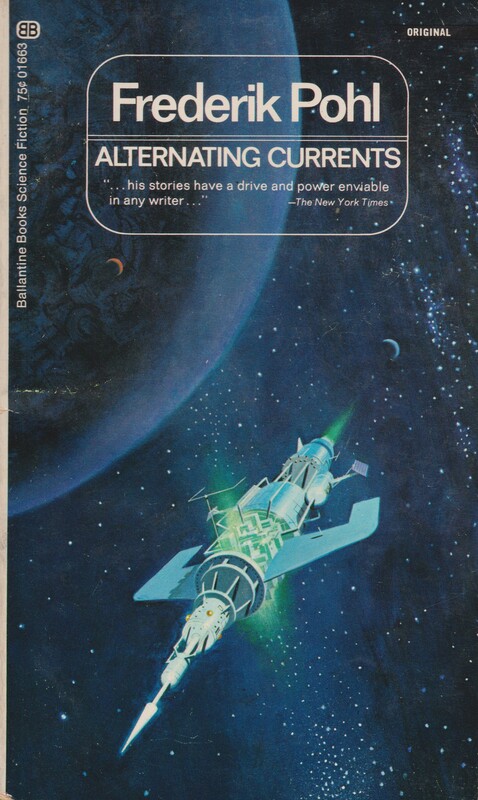 I have enjoyed the Pohl Kornbluth collaborations Search the Sky and The Space Merchants and I have to read the others. Pohl’s short story Day Million really impressed me, it seemed quite ahead of its time. I read Gateway which I was cool on but I want to go back and try the whole series. Heinlein is losing ground with me, I still like some of the juveniles and some short stories, Waldo is such a bizarre mixture of engineering, hokum and pseudo-science, I quite like it. I read a lot of Moorcock’s fairly repetitive fantasy series years ago but I should try some of SF. A follow up, I had a copy of the New Writings anthology ed. by Carnell that was mentioned in the link about Farnham’s Freehold and was intrigued enough to start reading. I have enjoyed the three stories I read so far and hope to discuss the collection this week. I look forward to your review! Come back and link it. I’m a funny guy, I truly enjoy most of Pohl’s fiction that I’ve read. Maybe I enjoyed the sociological bent of them. I too liked the the original Gateway novel, plus numerous other novels. Plus other short fictions like “The Gold at the Starbow’s End”, the snarky “The Midas Plague”, and others. But, that was so long ago. You keep reminding me on writers I need to go back and revisit. Loved Heinlein’s juveniles while growing up, when an adult, not so much. You overlook so much when you’re young. “Starship Troupers” was just unreadable. And re-reading Leinster recently, I’ve found him to be an up-and-down author. His style of writing has dated somewhat, but his ideas are interesting. The pulp story “Power Planet”, which I’m reading now, includes an artificial planet created just to beam solar power back to Earth. This is the earliest story that I’ve read to describe solar power as an efficient power source. You might like his later short stories best as he became a better writer as the years went on.